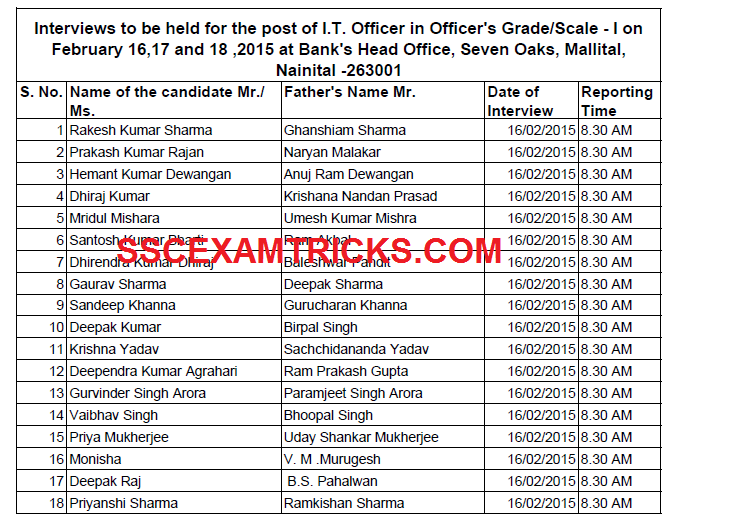 Nainital Bank has released the interview schedule of short listed candidates for the posts of which is scheduled on 16th, 17th and 18th February 2015 on 8:30 AM onwards to address Bank's Head Office, Seven Oaks, Mallital, Nainital – 63001. The interview call letters to these short listed candidates has been sent to their email address which was mentioned in the online application. A total of 331 candidates has shortlisted and called for interview. Earlier Nainital Bank has released advertisement notification for the various specialist officers in (1) Law, (2) Risk Management, (3) Company Secretary, (4) Information Technology and (5) Personnel. A list of those candidates is released and those candidates who had fulfilled the criteria for the posts of IT Officer Scale 1 are called for interview. Those candidates who had applied for these posts can download their interview schedule from the direct link provided in the end of the posts and must check their email address to find the interview letters. Those candidates who had not fulfilled the required criteria are not sent interview call letters. Reach the venue of Interview 30 minutes before the time mentioned. Bring computer generated online application, result print, original documents original along with one set of self-attested of all the documents to the venue of Main Examination. Address proof i.e. PAN Card, Ration Card, Aadhar Card, Voter card or Driving License. Bring two extra colored recent passport size photograph (same as pasted on computer generated application form). Bring Caste/PWD/EXS certificate to claim for seat available for reserve category. NOC (No Objection Certificate) in case of working somewhere. A Final Merit List / Final Result will be released on the official website of Nainital Bank. What was the criteria to shortlist the candidates for IT Officer interview?